Le Chatelier Flask is One of the most important cement testing equipment. Le chatelier Flask Manufacturerd by us is commonly used For determining density of powdered materials—limes, slag and hydraulic cement. Le Chatelier Flask manufactured by us Made from borosil glass. - Used for finding specific gravity of hydraulic cement. - Made from Borosilicate glass. - The flask is 243mm in total height, having a bulb of 90mm dia of 250ml approximate capacity. - The long neck of the flask has at top a funnel of 50mm dia in that fits a ground glass stopper. We are Leading Supplier of Le Chatelier Flask. Used for finding specific gravity of hydraulic cement. Made from Borosilicate glass. The flask is 243mm in total height, having a bulb of 90mm dia of 250ml approximate capacity. The long neck of the flask has at top a funnel of 50mm dia in that fits a ground glass stopper. The neck has over-all 11mm i.d. 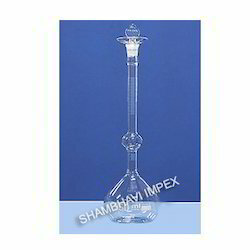 From our wide consignment, we are offering to our patrons an optimum class variety of LE Chatelier Flask. As Per IS 1727 - 1967; IS 4031 (Part – XI) - 1968. Used for finding Specific gravity of Hydraulic cement. Made from borosilicate glass. 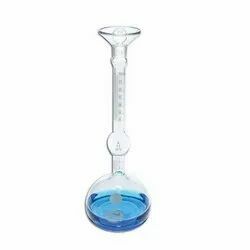 Rajco Le-Chatelier Flask for Specific Gravity Test IS : 4031.